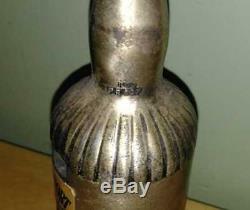 VINTAGE c1953 SOUTHERN COMFORT LIMITED EDITION OF 1000 BANK IN EXCELLENT CONDITION. 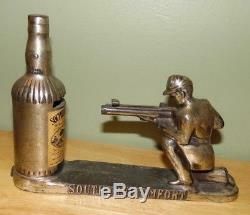 THIS IS A EXTREMELY RARE MECHANICAL BANK THAT SHOOTS A COIN FROM THE CONFEDERATE SOLDIERS GUN INTO THE BOTTLE OF SOUTHERN COMFORT RINGING A BELL INSIDE. 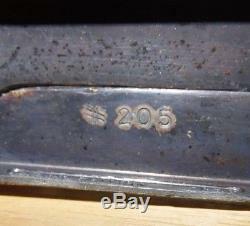 IT WAS MADE BY''DURO MOLD AND MANUFACTURING, INC'' DETROIT. 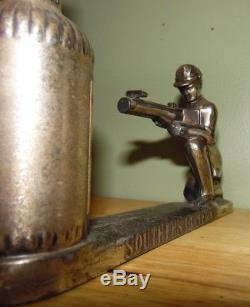 THIS IS ONE OF 1000 SILVER PLATED, SPECIALLY FINISHED MECHANICAL BANKS MADE FOR THE SOUTHERN COMFORT CORP OF ST LOUIS , MISSOURI, AND THAT THERE WOULD NEVER BE ANOTHER RUN MADE. 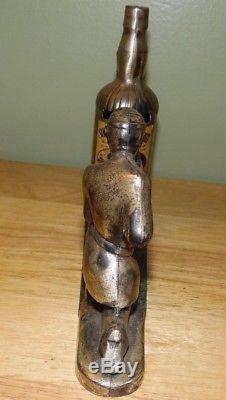 THIS IS BANK NUMBER 205 AND IT MEASURES APPROX 8 1/2'' LONG BY 6'' TALL. 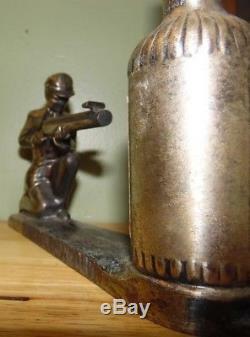 DURO MOLD AND MANUFACTURING , INC. MAKERS OF METAL COIN BANKS - NOVELTIES - DIE CAST DIES - & DIE CASTINGS. 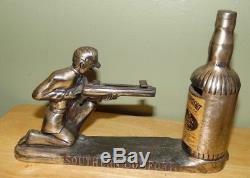 THIS IS A RARE PIECE OF SOUTHERN COMFORT HISTORY AND IT WILL BE AN EXCELLENT ADDITION TO ANY COLLECTION. THIS BANK IS 100% FUNCTIONAL AND IN VERY NICE LOOKING SHAPE. 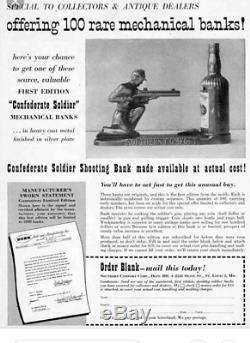 The item "1953 DURO SOUTHERN COMFORT MECHANICAL BANK SILVER PLATED # 205 OF 1000 SOLDIER" is in sale since Sunday, February 18, 2018. 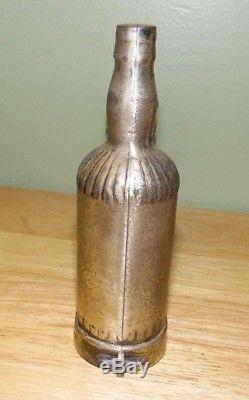 This item is in the category "Collectibles\Banks, Registers & Vending\Mechanical Banks". 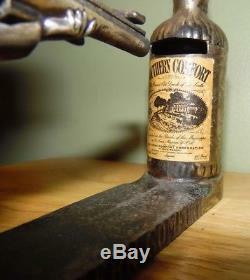 The seller is "sellingmaster456" and is located in Palmer, Massachusetts. This item can be shipped to United States, Canada, United Kingdom, Denmark, Romania, Slovakia, Bulgaria, Czech republic, Finland, Hungary, Latvia, Lithuania, Malta, Estonia, Australia, Greece, Portugal, Cyprus, Slovenia, Japan, China, Sweden, South Korea, Indonesia, Taiwan, Thailand, Belgium, France, Hong Kong, Ireland, Netherlands, Poland, Spain, Italy, Germany, Austria, Bahamas, Israel, Mexico, New Zealand, Philippines, Singapore, Switzerland, Norway, Saudi arabia, Ukraine, United arab emirates, Qatar, Kuwait, Bahrain, Croatia, Malaysia, Chile, Colombia, Costa rica, Panama, Trinidad and tobago, Guatemala, Honduras, Jamaica, Antigua and barbuda, Aruba, Belize, Dominica, Grenada, Saint kitts and nevis, Saint lucia, Montserrat, Turks and caicos islands, Barbados, Bangladesh, Bermuda, Brunei darussalam, Bolivia, Egypt, French guiana, Guernsey, Gibraltar, Guadeloupe, Iceland, Jersey, Jordan, Cambodia, Cayman islands, Liechtenstein, Sri lanka, Luxembourg, Monaco, Macao, Martinique, Maldives, Nicaragua, Oman, Pakistan, Paraguay, Reunion, Dominican republic, El salvador.